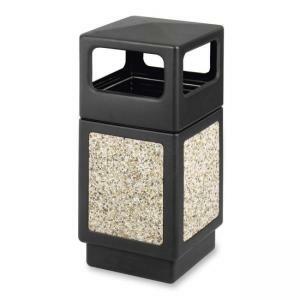 Plastic/Stone Aggregate Receptacles are molded from recycled high-density polyethylene with built-in UV inhibitors for years of service. Striking molded-in stone aggregate panels add beauty and serviceability. Unique Grab Bag system holds liner bags in place and out of sight. Uses standard 32" x 44" trash bags. 10-inch square ash urn built into lid (no sand required). Adaptable for anchoring or weighting devices.